Over the course of the past year Wally Cardona and Jennifer Lacey worked independently, creating encounters with individuals whose experience and expertise was outside the field of dance. Cardona’s project was called Intervention and Lacey’s was called My First Time With A Dramaturge. Each of them used this process – which manifested as 14 independent one-time performances – to create a solo. Then this summer they came together to create a duet and interpolate/integrate the solos into an evening length performance called Tool Is Loot. It is an interesting premise for an investigative creative process, but not having seen any of the 14 one-offs firsthand, I was left wondering how the information they gathered was integrated into the final product. Sometimes it seemed obvious – snippets of dialogue were included in Jonathan Bepler’s score – and one assumes these were taken from the non-dance experts that were part of the development process. Other times – for instance Lacey’s opening dance with a folding chair – it was less easy to tell. It raises an interesting, and recurring, question. How much do we need to know about background and process to appreciate the work itself? Can it be enjoyed and encountered on its own terms? Or is it absolutely necessary to know the entire backstory of a piece from inspiration to influence to process to implementation? Going into Tool Is Loot on Friday I didn’t know much of the backstory at all. I knew a little bit about Wally’s Intervention series but that was about it. And I found that even had I known less than that, I still would have enjoyed the piece. Both Lacey and Cardona are compelling dancers, in different ways. Cardona is quick and quirky – he did a lot of work on his tiptoes and with his upper body and arms. He is nimble and assured, transitioning cleanly and confidently between small, idiosyncratic movements and grander, sweeping gestures. Sporting a really bushy “Village People” moustache, he came off as kind of a jokester with an edgy undertone. Lacey is also quick and quirky but in a different way. She has a great sense of humor and moves with grace and precision, but where Cardona seems to move from his outer extremities, Lacey seems to have her energy more centered in her pelvis and core. She just feels very grounded and earthy and deeply vibrant. I may be a bit biased because my favorite part of the show was actually Lacey’s monologue to a chair, which was both touching and hilarious. She delivers the monologue as if she were on a date, at that point in the relationship where it has been casual and now it is going to get more serious because the connection has deepened. The scene could have felt awkward and misguided, but her delivery was so natural, open and funny that you immediately bought it and went with her. 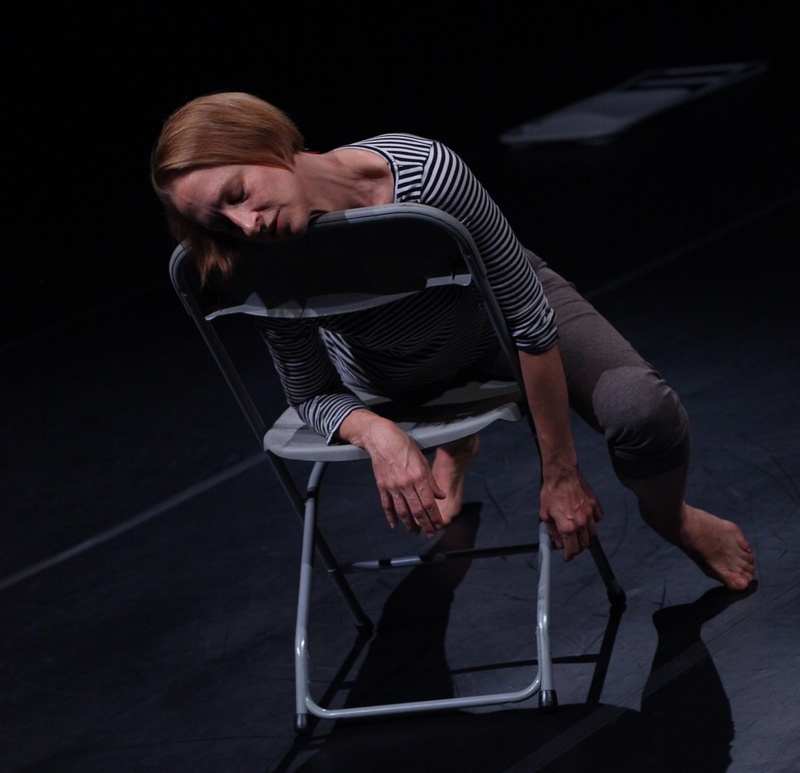 As the monologue morphed into a movement sequence in which she gets rather, um, amorous with the chair it was fascinating to see the humor give way to intense physicality. Cardona and Lacey’s dancing together was a great balance of their different energies and vocabularies and was consistently engaging. And though some people weren’t so crazy about the end sequence – basically a 5 minute light show after the dancers had left the stage – I found it to be a compelling coda or question mark, a cue to process information in a different way, to meditate on what we had just witnessed in the dance and think about all the other ways that ideas can be researched, embodied, transformed and transmitted. Tool Is Loot was a wonderful, thoughtful and engaging performance made by two very different but equally gifted dancers. It would be nice if we could have access to their “research” and see how they got from Point A to Point B. But who knows? Maybe they’ll revisit their investigation and making something else? Only time will tell.